Imanol Harinordoquy has confirmed that France's players rebelled against head coach Marc Lievremont during their Rugby World Cup campaign and managed themselves throughout the knockout stages. There were rumours of unrest within the French camp before the tournament even began, with one report suggesting that 25 members of the 30-strong panel had turned against Lievremont. The coach's public criticism of his troops after the laboured win over Japan on the opening weekend and their shock loss to Tonga in their final pool outing did little to quell the speculation that the players were planning a mutiny. Harinordoquy has now revealed that matters came to a head after their fortuitous qualification for the quarter-finals. "After the defeat against Tonga…. 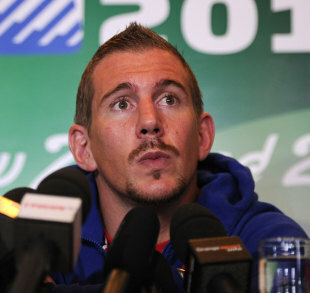 I did not attach too much importance to what Marc said," the Biarritz No.8 told Midi Olympique. "It was our adventure. It was meant to be the nice experience of 30 men. We had to free ourselves from his supervision." Harinordoquy argued that Lievremont had been the author of his own downfall by repeatedly berating the players in the media. "He cast the stone at us too often. When something goes wrong, we're all in the same boat. There are no good or bad guys," the veteran back-row said. It had already been decided that Lievermont would step down after the tournament and Harinordoquy admitted that he was not sorry to see the back of the former France international. "I felt he was lost," the Basque said. "I will not miss him." Meanwhile, Harinordoquy supported the view of many of his colleagues, and indeed a number of impartial observers, that South African referee Craig Joubert had been guilty of double standards in France's World Cup final defeat by New Zealand. "He was only looking at us," he said, before then accusing Joubert of allowing All Blacks flanker Richie McCaw a free rein at the breakdown. "He [McCaw] played the whole match in our camp. He did a lot of things and nobody told him anything. Three minutes from the end of the game, I saw him dive on the side of a ruck and he stayed there for ages."